My last guest post is by my very best bloggy friend (BBF) Laura from Craftstorming. I could write a whole post on how lovely Laura is, lets just say I don't go a day without chatting with her about this and that, she is funny, witty, kind and extremely generous. Even our kids have become pen pals! Now don't you all go and try to be her friend now- she is mine!!! I only have admiration for the amount of talent Laura has, I cannot believe she only recently started sewing- she is already producing her own patterns and when it comes to sewing, I've never seen anyone put so much care, attention and love in even the smallest of details. 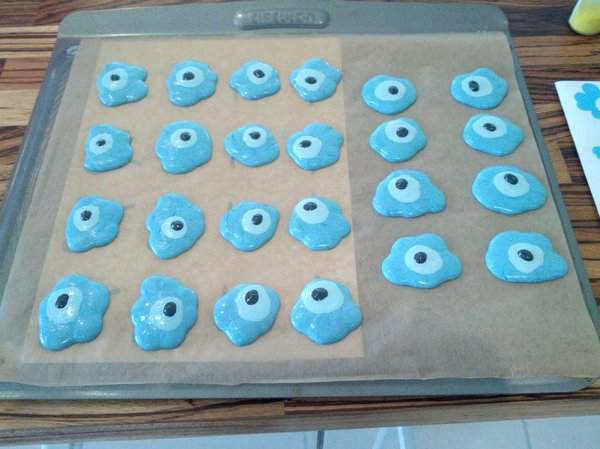 Laura doesn't only sew, she happens to bake too- yum look at her latest post! 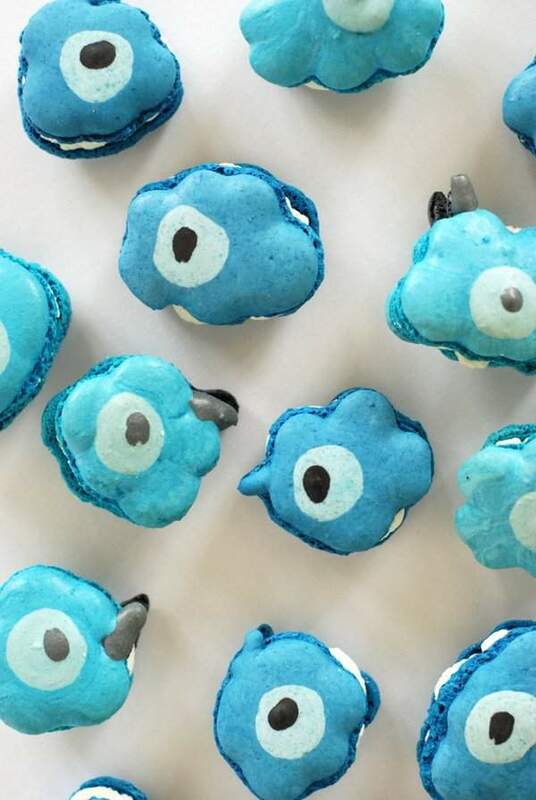 I have made a few macaron puns in my time – Macarunes, Quackaroons and Makka-Pakka-Roons have all featured on my blog. 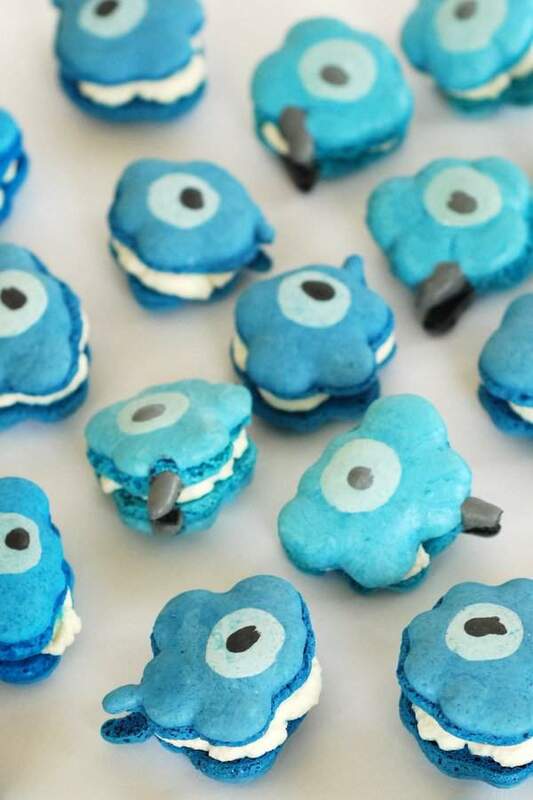 For a while it seemed like everywhere I turned a new macaron pun would present itself to me. When I thought of these Marimekko-roons I was surprised it had taken me so long. 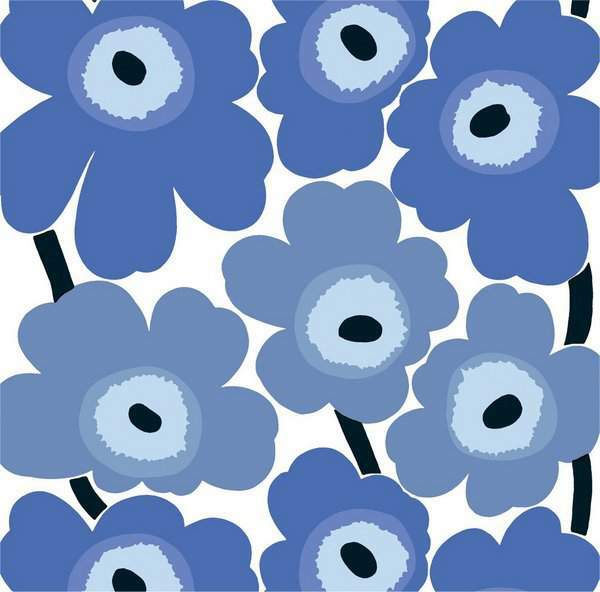 You see we have this Unikko print in blue on our bedding and also have a Fat Boy (very large bean bag) with the print in black. I can see the Fat Boy from my kitchen and one day, while making some other macarons, I had a light bulb moment. One thing I loved about this was that it combined my love of sewing and fabric with my love of baking. After a bit more time this inspired the whole Sew Yummy series. Here is a picture of the original print for anyone who isn’t familiar with it. This iconic print was created in 1964 as a result of textile designer Maija Isola protesting against an announcement by Armi Ratia that Marimekko would never print a floral pattern. It has grown to become Marimekko’s signature print and her daughter Kristina is now responsible for any new colourways of the design. To turn the print into macarons I separated my macaron mixture into four different bowls and coloured each a different colour. Three were subtly different shades of blue and the last bowl I attempted to colour black. Unfortunately I ran out of black food colouring but I quite like the grey again the blues. I placed my template underneath the baking paper and piped the darker blues first, then a small circle of the lighter blue on top. After that I added the black/grey details. This is the same method I used to make Fried Egg Macarons. Here is what they looked like before I put them in the oven. I’d say that these are the fiddliest macarons I’ve attempted, due to the shape and using so many colours. I am also a little bit out of practice so these are far from perfect – my husband helpfully suggested I read the tips in this post. Fortunately I found I liked them a lot better once I’d added the simple white filling and arranged them all together. To fill them I just used whipped cream – I didn’t sweeten it as macarons are so sweet that the extra sugar isn’t necessary. It tastes just like eating a mini pavlova and would be even more delicious with the addition of a few blueberries. You can find the macaron recipe in my Christmas Pudding Macarons post. You can download the Unikko template by clicking on the link below if you’d like to try these yourself. 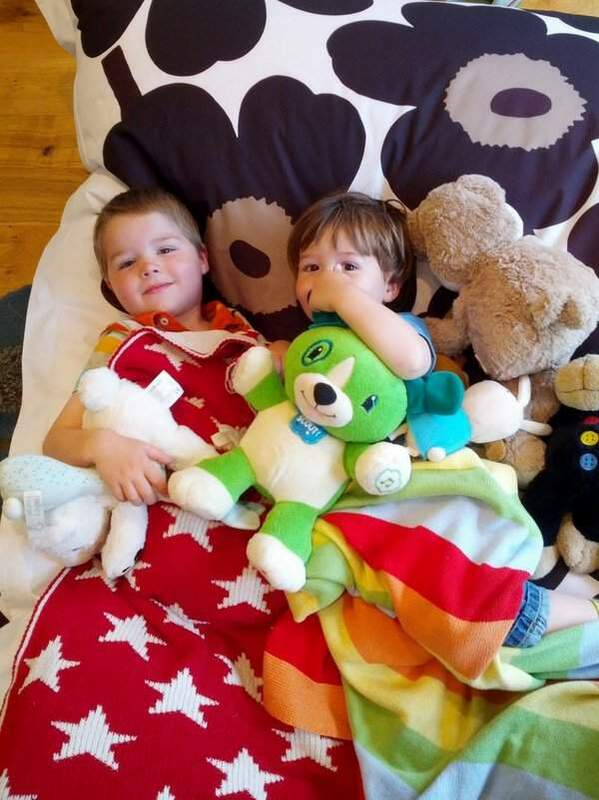 I think this post is in danger of looking a little bit blue so I’ll end with a picture of my two boys cuddling up on our Fat Boy with a large scale black Unikko print.